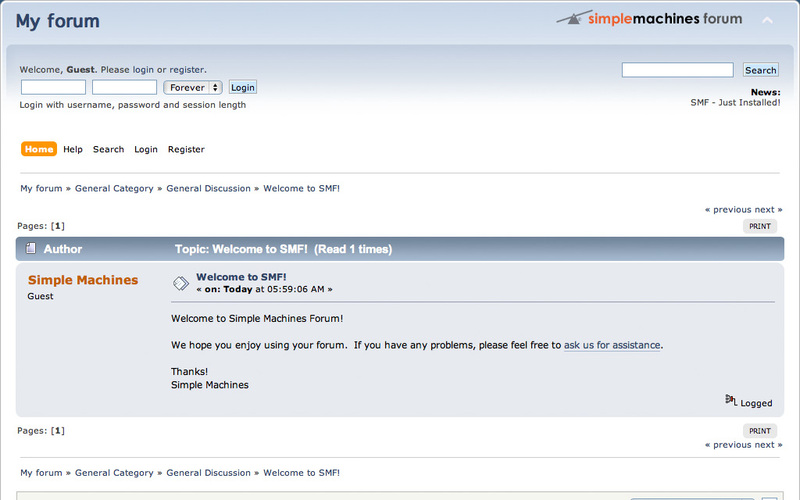 Simple Machines Forum est une application gratuite de forum. 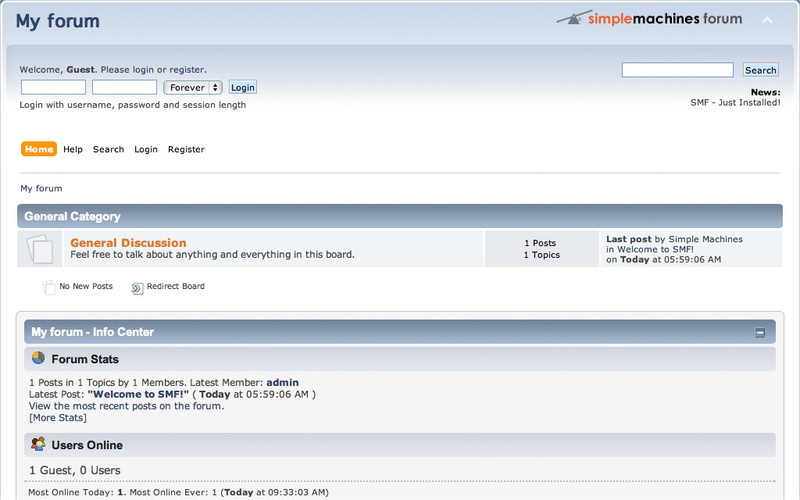 Simple Machines Forum est dérivé de YaBBSE en 2003. 23 Juin 2017 - 22MBThis patch adds both security and general maintenance fixes to your forum, so it is imperative that you install this patch quickly. Fixed an issue where the file version of Subs-Post.php could have been 2.0.8 or 2.0.11. It will be updated to 2.0.12 in either case. 23 Septembre 2015 - 22MBThis patch is a security release, which focuses on fixing a minor security vulnerability reported in the software, therefore, it is important that you install this patch in a timely manner. Update: Fixed an issue which could prevent the update process from completing successfully. Updates affected by this issue can be re-started from the UI. Add additional emails in Paid Subscriptions settings for PayPal business accounts. 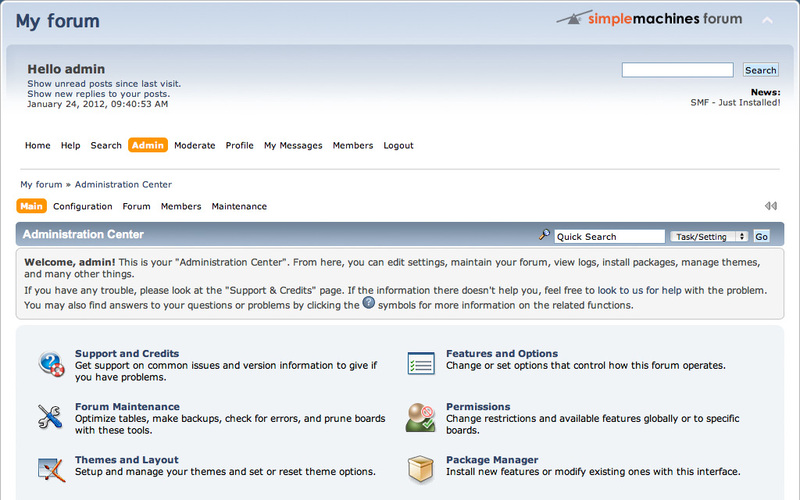 Install and Update: Added revisions published by Simple Machines Forum. Made sure some of the calendar holidays are corrected when previously incorrect. If an uploaded file somehow has an image size but isn't really an image, don't try to treat it as an image. Make file cache somewhat less fragile. Privacy and original sending time were not kept in the mail queue in the event of sending failure. Made the anti-XSS header a little less picky. FIND_IN_SET wasn't always properly set up for PostgreSQL use. Multiple installed themes with variants wouldn't all be able to be selected properly. 22 Octobre 2013 - 22MBCritical security issues have been identified and are fixed with this update, therefore it is recommended to make sure you update your forums immediately to ensure your community is safe. A few other minor bugs have also been fixed. 12 Août 2013 - 22MBCritical security issues have been identified and are fixed with this update, therefore it is recommended to make sure you update your forums immediately to ensure your community is safe. A few other minor bugs have also been fixed. Added compatibility for CloudLinux CageFS. 1 Février 2013 - 22MBCritical security issues have been identified and are fixed with this update, therefore it is recommended to make sure you update your forums immediately to ensure your community is safe. A few other minor bugs have also been fixed. 16 Décembre 2012 - 22MBCritical security issues have been identified and are fixed with this update, therefore it is recommended to make sure you update your forums immediately to ensure your community is safe. A few other minor bugs have also been fixed. The most relevant bug fix is an issue that will arise in few months with PayPal: starting on February 1, 2013 PayPal will only accept headers which comply with the HTTP 1.1 specification. 22 Octobre 2013 - 10MBCritical security issues have been identified and are fixed with this update. 1 Février 2013 - 10MBCritical security issues have been identified and are fixed with this update.